December 7, 2015 By Michael I. Sanders, Esq. In September 2015, The National Geographic Society (“NGS”), an Internal Revenue Code (IRC) Section 501(c)(3) organization, announced that it was forming National Geographic Partners (“NGP”), a for-profit joint media venture, with 21st Century Fox (“Fox”). The announcement was met with a flurry of attention and commentary because of the participation of a high profile charity and a large financial investment by Fox ($725M). While many details of the transaction are not yet known, because a wholly-owned second tier subsidiary of NGS holds its interest in the venture, the venture appears to follow IRS guidelines, which sanction the properly structured use of for-profit subsidiaries by IRC Section 501(c)(3) organizations. Nearly two decades ago, NGS joined with the predecessor corporation of Fox and other for-profit entities to commercially distribute its documentaries, which were initially produced for public television stations, and to establish international broadcasting outlets for its products. 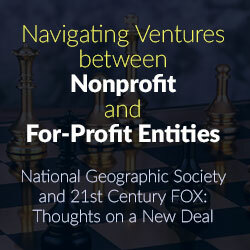 In this new venture, Fox has paid $725M to NGS for the contribution of NGS assets, including its television channels, related digital and social media platforms, as well as travel, location-based entertainment, catalog, licensing and e-commerce businesses. According to NGS’s press release, the transfer of these assets to the venture will allow NGS to focus on its Section 501(c)(3) purposes of increasing knowledge through science, exploration and research. NGS’s ability to achieve these goals will be enhanced by the $725M it received from Fox. It appears that NGS’s media expenditures have exceeded revenues from educational activities. For example, on its most recent publicly available Form 990 tax return for 2013, NGS expended $168.3M to produce National Geographic Magazine, which generated $52.8M in revenue from an average worldwide circulation of 6.2M readers. NGS’s 27% interest in NGP is being held by a second tier for-profit subsidiary, i.e., a wholly owned NGS for-profit subsidiary is the sole owner of a for-profit entity that will hold NGS’s share in NGP. For its 73% interest in NGP, Fox is contributing the $725M and its expertise in global media platforms. Reflecting NGS’s indirect ownership in the venture, control of NGP does not parallel the parties’ respective financial interests; rather, the eight member board of directors of the venture will have equal representation from NGS and Fox. In addition, the chair of the board will alternate annually, with NGS and Fox controlling the selection on an alternating basis with the initial chair having been chosen by NGS. We understand that NGS obtained opinions of counsel regarding the valuation of the assets it transferred to the venture as well as regarding the tax aspects of the underlying transaction itself. The IRS has long sanctioned the creation of for-profit subsidiaries by Section 501(c)(3) organizations. The purposes are varied: to insulate a charity’s assets from liability relating to a particular activity or transaction; to separate one or more commercial activities from the charity’s exempt activities; to avoid unrelated business taxable income; and/or to avoid jeopardizing the parent’s exempt status. When using a taxable subsidiary in a transaction, it is important to maintain corporate formalities and independence of the subsidiary’s board, so that separate identities of the organizations will be recognized, thereby avoiding attribution of the activities of the for-profit subsidiary to the parent. This is important so that the Section 501(c)(3)’s programs and activities will remain “exclusively” in furtherance of its charitable purposes. While there can be some board overlap, it is advisable to keep the boards as separate as possible. Moreover, the operating documents should reflect that there is no agreement, oral or written, that the parent charity would be allowed to actively participate in the subsidiary’s day-to-day activities. The goal is to make sure that the taxable subsidiary does not appear to be an instrumentality of the charitable parent. In Rev. Rul. 98-15, the critical issue was whether the nonprofit party retains ultimate day-to-day “control” of the joint venture and “control” over all charitable aspects of the joint venture. Rev. Rul. 2004-51 further clarified the control issue in an ancillary venture, by stating that control can be bifurcated, so long as the exempt organization controls the substantive, charitable aspects of the joint venture. In this type of venture, day-to-day control over the entire joint venture is not required, although there could be an issue of unrelated business taxable income (UBIT) arising from the venture. The potential issue of UBIT in the NGP venture seems to have been addressed head-on by virtue of NGS’s subsidiary being subject to tax as a for-profit entity. While the IRS has provided some guidance, every joint venture between nonprofit and for-profit entities is examined based on all of the facts and circumstances. It is important to note that the IRS will not issue rulings on a proposed joint venture between a charity and a for-profit partner except in connection with an application for exemption. In general, a 501(c)(3) will not jeopardize its tax exemption when entering into a joint venture with a for-profit organization so long as (1) the 501(c)(3)’s participation in the partnership furthers its charitable purpose and the partnership will operate exclusively for charitable purposes; (2) the 501(c)(3) maintains control over the partnership’s charitable assets and activities; and (3) there is no impermissible private benefit to the for-profit entity. The revenue rulings also provide unfavorable factors that should be avoided, such as a disproportionate allocation of profits and/or losses in favor of the for-profit partners; a profit motivation by the exempt partner; or a guaranteed return for the for-profit partners. While NGP is a venture between a second tier for-profit subsidiary of a Section 501(c)(3) organization and a for-profit partner, the fundamental principles behind the joint venture guidelines are applicable: the charity should retain control over the venture’s programs and activities and there must be no inurement to the for-profit partner. Although Fox will own 73% of NPS, the type of control the IRS is concerned with is not ownership control, but rather voting control, which will be split 50-50. NPS will have an eight member board with equal representation from NGS and Fox; the current NGS president, Gary Knell, will serve as the initial board chair. Fox and NGS have partnered for nearly twenty years. In this new venture, it appears that both Fox and NGS are motivated by increasing their respective revenue streams and the scope of their media outreach. The $725M million payment will increase NGS’s endowment to nearly $1 billion that will be used to further its educational goals, along with income from the venture, while consolidating its media and related ancillary operations. For its part, Fox will gain access to millions of new NGS customers, including 6.2 million magazine subscribers, 100 million Facebook followers, 10 million Twitter followers, and 30 million Instagram followers. Equal board representation by NGS and Fox will allow NGS to protect its interests while providing a revenue stream that is taxable at the subsidiary level but tax free as a dividend at the NGS level. Once again, NGS appears to be at the forefront of strategic planning initiatives. General Counsel Memorandum 39,326 (January 17, 1985); Private Letter Ruling 9542045 (October 20, 1995). Private Letter Ruling 1999938041 (September 27, 1999). A model joint venture participation policy is provided in Joint Ventures, Appendix 4B. Gen. Couns. Mem. 39,862 (Nov. 21, 1991). By Michael I. Sanders, Esq. with assistance of Dustin Lauermann, an Associate at Blank Rome LLP, and Gayle Forst, Of Counsel at Blank Rome. About Michael I. Sanders, Esq. Michael Sanders is the lead partner of the business tax group in Blank Rome LLP’s Washington D.C. office. He focuses his practice on tax matters affecting exempt organizations, partnerships, limited liability companies, real estate, and New Markets Tax Credit transactions. Mr. Sanders is also an adjunct professor of tax at Georgetown Law Center and GW Law. He is the author of a treatise on Joint Ventures Involving Tax Exempt Organizations, Fourth Ed. (John Wiley).